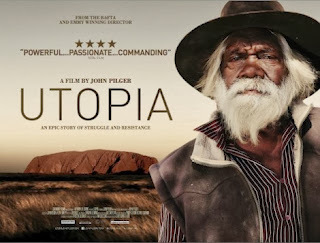 Utopia is a near sequel to Australian journalist and film maker John Pilger's 1985 documentary The Secret Garden which looked at the lives of the first people or Aboriginal people of Australia. Pilger concentrates his documentary around the area called Utopia where a large section of the Aboriginal community now lives. The documentary's title is more than ironic when the poverty likened to Third World conditions in which the Aboriginal people live brings Australia under continued criticism from the UN. However, as the documentary points out, the area of Utopia happens to sit on some of the most abundantly wealthy mineral rich areas in the world. The history of the genocide and racist crimes perpetrated against the First Australians by the colonial mostly European Australians is examined. Social attitudes about what it is to be an Australian and how the citizens of Australia view themselves is compared and contrasted between the people living in Utopia today verses, for example, a wealthy suburb of the country's capital, Canberra. Pilger consistently asks government officials what, if any, progression has been made in regards to the Aboriginal Australians with a clear Them and Us attitude being exposed. The discovery of such mineral wealth in Utopia has lead Pilger to investigate the more recent government policies and interventions into the community. The documentary makers do not have to work particularly hard to show the outrageous levels of what can only be described as apartheid in Australia. Well structured and bringing a credence to his film due to Pilger's decades long relationship with subject as well as his questioning his fellow Australians, Utopia is a powerful piece of documentary film making. Confronting, uncomfortable and revealing Utopia asks socially relevant questions unmasking the sheen of a history of colonial propaganda.